When 82-year-old Masako Wakamiya first began working she still used an abacus for maths - today she is one of the world's oldest iPhone app developers, a trailblazer in making smartphones accessible for the elderly. "As you age, you lose many things: your husband, your job, your hair, your eyesight. The minuses are quite numerous. But when you learn something new, whether it be programming or the piano, it is a plus, it's motivating," she says. "Once you've achieved your professional life, you should return to school. 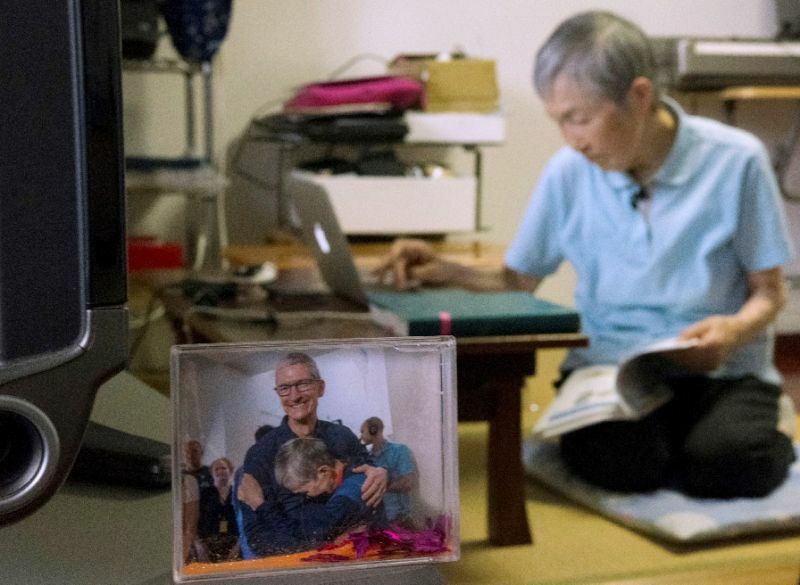 In the era of the internet, if you stop learning, it has consequences for your daily life," Wakamiya explains during an AFP interview at her home near Tokyo. She became interested in computers in the 1990s when she retired from her job as a bank clerk. It took her months to set up her first system, beginning with BBS messaging, a precursor to the internet, before building her skills on a Microsoft PC, and then Apple's Mac and iPhones. Wakamiya learned the basics of coding and developed 'Hinadan' one of Japan's first dedicated app games for the over-60s - she is now in such demand that this year Apple invited her to participate at their prestigious Worldwide Developers Conference, where she was the oldest app creator to take part. 'Hinadan' - 'the doll staircase' - was inspired by the Hina Matsuri, a doll festival which takes place every March, where ornamental dolls representing the emperor, his family and their guests are displayed in a specific arrangement. In Wakamiya's app, users have to put them in the correct positions -- a task which is harder than it sounds, requiring memorisation of the complex arrangements. And while these figures are relatively small compared to Japan's big-hitting apps which are downloaded in their millions, 'Hinadan' has proved popular enough that Wakamiya plans to release English, Chinese and possibly French versions of the app before next year's festival. Its success has propelled her on to the tech world stage, despite the industry's reputation for being notoriously ageist. But international tech firms and start-ups are slowly waking up to the economic potential of providing for silver surfers, and Wakamiya has already met with Apple's chief executive Tim Cook. Wakamiya recalls: "He asked me what I had done to make sure that older people could use the app. I explained that I'd thought about this in my programming - recognising that older people lose their hearing and eyesight, and their fingers might not work so well." "Mr Cook complimented me," she says proudly, adding that he had hailed her as a "source of inspiration". Wakamiya concedes that she finds "writing lines of code is difficult" but has a voracious appetite to learn more. "I want to really understand the fundamentals of programming, because at the moment I only learned the elements necessary for creating Hinadan," she explains. More than a quarter of Japan's population is aged 65 and above, and this is projected to rise to 40 percent by 2055. The government is struggling to ensure its population remains active and healthy - and so also see the dynamic octogenarian as an inspiration. "I would like to see all Japanese elderly people have the same motivation," one official told AFP. Wakamiya says her ultimate goal is to come up with "other apps that can entertain older people and help transmit to young people the culture and traditions we old people possess". "Most old people have abandoned the idea of learning, but the fact that some are starting (again) is not only good for them but for the country's economy," said Wakamiya, who took up the piano at 75. Hinting that her good health is down to an active mind and busy life, she adds: "I am so busy everyday that I have no time to look for diseases."